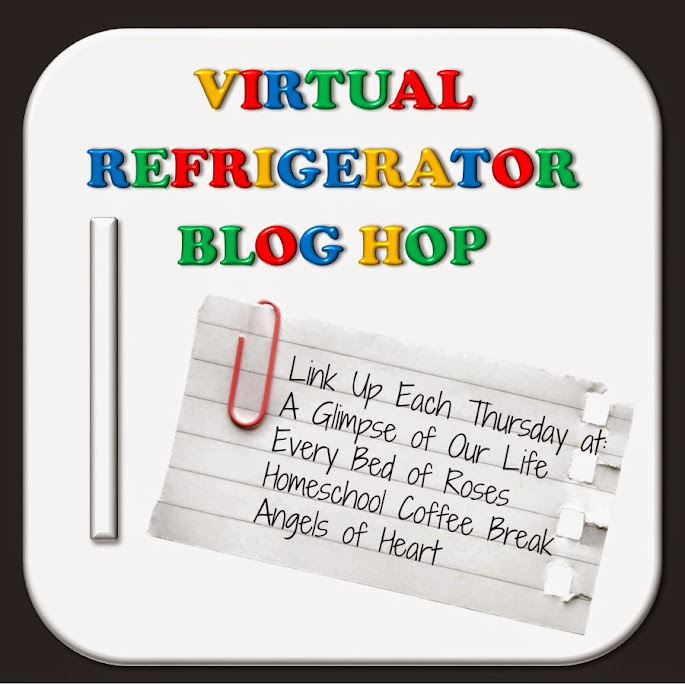 After a little planning with some friends, the Virtual Refrigerator is back! 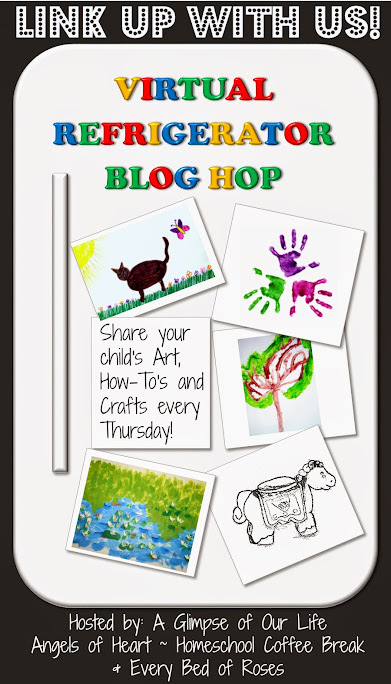 Welcome to the new and improved blog hop. I hope you enjoy the changes. Each week the blog hosting the meme will rotate between A Glimpse of our Life, Angels of Heart, Homeschool Coffee Break, and Every Bed of Roses. Add your link then hop over and visit a few more blogs linked up. Next week the meme will be hosted by Kym at Homeschool Coffee Break. Holidays for us usually also means family time. Today, we get to spend the day with both my husband's parents and my parents. My son spent Monday with my mom, too, and started his first oil painting. My parents built their house while I was in college, so "my room" was technically only my room for a brief time. It has since progressed from guest room to the current happy place known as the "art room." My kids all look forward to painting with Grandmommie. She covered the floor with vinyl tablecloths to catch any paint splatters, and they have spent many happy hours creating there. Downstairs, a little art in the kitchen: my daughter's new pie crust recipe was a success. Thanks to Heather at Only Passionate Curiosity, you can grab the image below and help us share about the linky. love this - especially the basement picture. 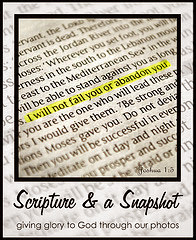 Thanks, Janis, and thanks for linking up! That's pretty cool to have a whole art room, and a grandmommie that encourages experimenting with art that way! Kym, they have so much fun there. I am so thankful we live close to them now, and that they take so much time with the kids. I love it! I can't wait to see more beautiful artwork! Glad to see y'all up and rolling! Looking forward to following along with all the beautiful artwork. Great idea! I'll have to remember this! We have an art center... I'd love to see it evolve more fully!